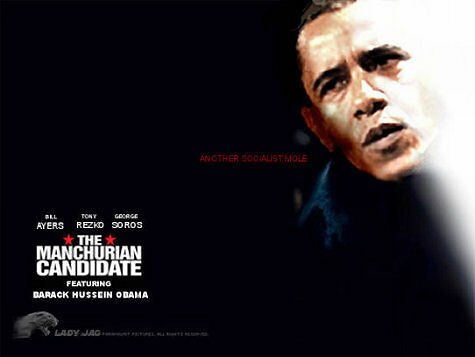 Is Barack Obama the Manchurian Candidate ? He’s supplying Syria with weapons to overthrow Hassad’s regime, knowing that it will be replaced by the Muslim Brotherhood as it was in Egypt and Libya (and Tunisia as well, I think; not sure) and he will continue supporting uprisings with our money and weapons until the entire Arabic world is under the control of the Muslim Brotherhood, and thus united. There’s a school of thought that the ambassador and the three other Americans died because they knew too much about this. Because there are something like a solid billion Muslims around the world, and as it’s estimated something like 10% are radical, that leaves something like 100 million radical Muslims, and with the arms they are acquiring, they will possibly be the world’s most numerous army. They will be ready to invade any country they wish and completely take over. Groups like Hamas and al-Qaeda may well be seriously weakened, but the Muslim Brotherhood is not. That would include these United States, particularly if and when he and the UN finally succeed in their quest to disarm us. They know they cannot win with – as Yamamoto put it – “a gun behind every blade of grass.” But the drive behind their incessant quest to negate the 2nd is now obvious. If he’s re-elected, or succeeds somehow in suspending the transfer of power, Armageddon may well be under way. I say “Armageddon” because a friend of mine who’s a serious Biblical scholar has found that the reference to the identity of the antichrist in the Book of Daniel was not “666” in its original form, but because that book is a mix of Greek and Hebrew, that ID consisted of Greek letters that stood for “In the name of Islam.” For the significance of that to fully hit you, remember that Daniel was written in the 7th century BC, some 1300 years BEFORE Muhammad was born and began his death cult. So the antichrist is not a person but a people. Those people now exist and are obsessed with the takeover of the planet as well as the destruction of all other faiths and those who “cling” to them. Source: I put this in a Word document to prevent this message’s interception and monitoring via keyword recognition in the body of the email.